20:22 - Uti schools Nhlanhla and home boy Tayo about how to navigate the game while Elikem tries to soften Butterphly. 20:06 - Idris in the diary room, the way he sees things they stand to learn a lot from the ex-housemates. 19:50 - M'am Bea follows his country mate Elikem inside the diary room. She, along with everyone else, agree that Tayo is the one buckling most under the new pressures in the house. 19:30 - Newly punished Trezagah says that Botswana's Miss P has a bit of a bad attitiude and comes across as short tempered. 19:15 - Leonel tells Biggie that Butterphly needs a bit of a "situtaion"... whatever on earth he meant, it remains to be seen. 19:01 - JJ gets some time to get stuff off his chest to Biggie. 18:15 - Trezagah has been automatically put up for eviction next week for moving during the freeze task last evening. Sheillah and Nhlanhla have been warned against tampering with their microphones and whispering in bed, they'll be tied together for 48 hours as a punishment. 18:04 - Vimbai feels that they are "doing well with this mission." She says her and Uti are teaming up and she knows that Ellah and Sipe do not like her. She likes Idris and Tayo. 17:56 - Butterphly says that Vimbai is a bit crazy. She adds that she is not threatened by her, she feels confident and believes in herself. 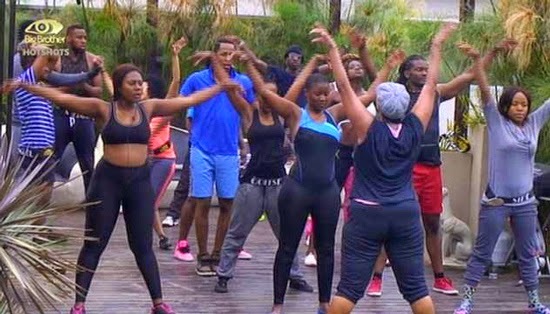 16:46 - Housemates have been given a Channel O task, they're required to team up with their fellow countrymates and come up with a song. 15:51 - Ellah tells Big Brother that she's going to be Ellah and not let anyone take away her position in the house, she says that Ellah plus plus is going to come out. 15:33 - Denzel is in the diary room, reclining. Bitter sweet experience to be back and a little creepy is how he feels. He thinks that the Hotshots are not having a good time. Denzel has difficulty in hearing and is a bit drunk. He finds Nhlanhla fickle. Sheillah is having a tough time being HoH, and he feels that they are all feeling the pressure. 15:22 - Nhlanhla feels that there is a lot of drama and he is thankful for the new energy in the house: "Good competition." "If we were hot before, we are like lava melting the flow." He reckons that Tayo is feeling the pressure. "I think that you could have chosen a better replacement." He is dismissive of Luclay. 15:18 - Tayo says that everyone in the house has changed, Butterphly and Goitse are now louder than before. Biggie tells him that, "Tayo, you are the Hotshot and you should continue to keep playing your game." 14:57 - Luclay starts off by saying that he is really happy to be back in the house. This is bringing back amazing memories for him. He finds Denzel weird. He says he will only unleash himself if he is pushed. 14:47 - Uti feels that everyone is taking it too seriously, he can see that everyone is completely scared. He is loving the prank. He says they're trying to be careful to not push anybody too far. It has brought out a bout of introspection in him. He says he is trying to get Tayo to calm down a bit. 14:22 - Goitse tells Biggie that she's quite cool with having Miss P in the house and she is fine with having her as competition. Among the ex-housemates she likes Feza, Denzel and Natasha. 14:14 - Miss P is relaxed and enjoying the vacation. That she is playing the game but is being careful not to give away her strategy. She says she's going to act as Sheillah's deputy HoH. 14:03 - Sheillah talks about her altercation with Elikem, she feels that she was stupid to overreact and she's going to carry on with her HoH duties and make sure they win the wager. 13:55 - Sipe discusses Natasha and says that she is not what she expected and likes her. She feels that the other ex housemates are playing mind games with her, she mentions Luclay, Miss P, Vimbai and Uti. She stresses that she is the glam queen and nobody is going to steal her shine. 13:42 - Mama Africa Natasha is excited to be back again, she says she has already started cleaning and putting the house in order. She says that she wants to get the housemates to have fun and to entertain. She feels that Tayo is feeling the pressure as he knows that Uti is also big back home and in Africa. She said that she had a good chat with Sipe who apologized to Natasha for saying what she did. 13:38 - Macky2 tells Biggie that he likes Elikem the least as he is always causing drama. He likes Luclay because they had a conversation and that he feels he understands him. He says that he is going to continue being his usual self as it has gotten him this far already. 13:25 - Sulu kicks off today's diary sessions, he says he's privileged to be back in the house, that he's looking at this as an ambassador for Big Brother. He feels that Nhlanhla has a bit of an attitude, but doesn't have an issue with him. He also says that he is attracted to Ellah and Goitse. 13:15 - Natasha is preparing a meal while Ellah is washing the dishes and chatting to Denzel, she tells him that this is a different game and she's proud to have made it this far. 12:19 - Biggie warns that no sun glasses should be worn in the Big Brother house. 11:55 - Housemates get on with the practice in the lounge. 11:45 - Housemates gather in the lounge, a stuntman is in the house to teach them some acrobatics. 11:38 - Sheillah reads out the task brief from Biggie but she can't be heard properly, Elikem reads it again. 11:30 - Biggie tells housemates to stay in the bedroom until further notice. 11:10 - Vimbai cosies up to Luclay on the couch, they talk about hiding props from the Hotshots. 11:08 - The store room is open, housemates receive their weekly supply of food and other items. 11:07 - Butterphly tells Ellah, "Your beautiful Ellah and no one can take that away from you." 10:58 - Elikem advises HoH Sheillah to do her job of taking charge. They argue about it with Sheillah saying she won't push people. 10:41 - Uti, Vimbai and Miss P tease Tayo about being scared. 10:13 - Housemates gather in the kitchen for breakfast. They're enjoying honeywell noodles among other edibles. 10:04 - Sheillah says she wishes Samantha was still in the house to put people in their place. 10:00 - Biggie says hot water is no longer available. Shower hour ends. 09:45 - Uti says he will getting all the Nigerian votes, much to Tayo's vexation. 09:20 - Natasha shares with Idris that love is all about giving and not expecting anything in return. They talk about his relationships in the house. 09:15 - Natasha to Idris: "Everybody flips". Idris to Natasha: "If you don't flip you are fake". 09:12 - Natasha tells Idris that initially Africa perceived them as quiet housemates and less entertaining, she advises him to play his game and continue entertaining Africa. 09:02 - Hot water is available, says Biggie. The girls run to the shower. 08:58 - Elikem brought in outfits for the ladies, they are all excited, he also offers to adjust the sizes if need be. 08:55 - Countrymates Idris and Feza have a chat upstairs. 08:52 - JJ and Nhlanhla gossip about Feza and Goitse. 08:42 - Sheillah asks Biggie to open the store room so that they pick bread. 08:40 - Denzel is having trouble lifting the weights, but he doesn't give up. 08:30 - The boys work with the weights, Sulu and Uti chat up a storm on the veranda. 08:00 - Housemates take part in the morning exercise session, Denzel is having some invaluable fun. What is it about this Tayo I am getting tired of hearing this name now as if he is the only housemate. Are dey madddttt or something!!!! Tayo is the craziest!!... If ure tired of hearing his name, then stop watching big brother africa!! Tayooooo the bomb, the craziest, the hotshot!! D craziest hm is Tayo. Yes,this Ellah gal must win..we Kenyans are fully behind her. SINCE WE KENYANS do not have a rep.we join hands with Rwanda and vote for the Ugandan queen. Tayo is the craziest housemate. Monkey2 as somebody calls him puts me to sleep merely looking at him, very boring. Tayo is the real deal, the Hotshot! Haters go...urselves. Where has Tayo's craziness gone to he is so confused and quiet now he thought he was the best .......now just looking lost.......Mackey 2 the craziest and he and idris are the hotshots, play your game guys we are behind you.....team Mackey 2 and Idris. Tayo Camera loving is that being crazy? Craziest Tayo... Dem go nor! !